When Marion Winik fell in love with Tony Heubach during a wild Mardi Gras in New Orleans, her friends shook their heads. For starters, she was straight and he was gay. But Marion and Tony's impossible love turned out to be true enough to produce a marriage and two beautiful sons, true enough to weather drug addiction, sexual betrayal, and the AIDS that would kill Tony at the age of thirty-seven, twelve years after they met. In a memoir heartbreaking and hilarious by turns, Marion Winik tells a story that is all more powerful for the way in which it defies easy judgments. As it charts the trajectory of a marriage so impossible that it became inevitable, First Comes Love reminds us—poignantly indelibly—that every story is a special case. 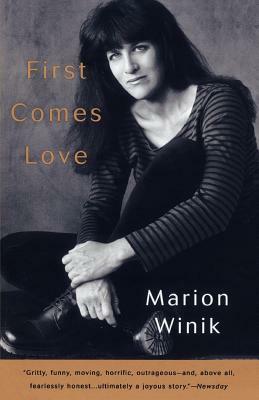 Marion Winik is heard regularly on National Public Radio's "All Things Considered." She was the recipient of a 1993 National Endowment for the Arts Fellowship in Creative Nonfiction and has been voted Favorite Local Writer by the readers of the Austin Chronicle for four consecutive years. First Comes Love won the Violet Crown Award for Best Book by an Austen Writer, 1996, from the Austen Writer's League. The author of Telling, she lives in Austen, Texas, with her two sons.